Our Assistance Centre is there to help you 24 hours a day, 365 days a year. Manulife Global Travel Insurance can help you focus on what matters: your trip – because it can help protect you from financial worries in case of the unexpected. With Manulife Global Travel Insurance, you’ll get 24/7 multilingual assistance – and many plans feature the added comfort of Medical Concierge Services,* which includes physician consultations, referrals, lost prescription delivery and much more, all by calling a toll-free number. For more details and other plan options, see “Plan Details” below. To get a quote for Annual All-Inclusive plan and Annual Medical plan, please contact your travel agent. Emergency Hospital & Medical: $5,000,000. Also includes coverage for Accidental Dental, Medical Repatriation, Accommodation & Meals, Expenses for Childcare, Expenses Related to Your Death, and Terrorism Coverage. Medical Concierge Services: Anywhere you travel, telephone access to a qualified physician who can assess your symptoms and provide treatment options. Available in 86 countries and over 4000 cities, access to physician house call visits. Trip Cancellation: Up to the covered amount selected. Trip Interruption: Unlimited, including up to the covered amount for the prepaid unused portion of your trip, plus paid-for events, and more. Flight Accident: Up to $100,000. Travel Accident: Up to $50,000. Baggage Loss, Damage & Delay: Up to $1,500, including passport replacement. Cancel for Any Reason: 50% of the covered amount for the cost of your trip if you cancel 14 days or more before your departure date. Baggage Loss, Damage & Delay : Up to $1,500, including passport replacement. Trip Interruption: Up to the covered amount for the prepaid unused portion of your trip, plus paid-for events, and more. Medical Concierge Services*: Anywhere you travel, telephone access to a qualified physician who can assess your symptoms and provide treatment options. Age Limit: Must be under age 60. Canada All-Inclusive: The same coverage provided by the All-Inclusive Plan, but only for travel within Canada, outside your province of residence. No age limit. Travel Canada: The same coverage provided by the Global Medical Plan, but only for travel within Canada, outside your province of residence. No age limit. Medical Preferred: “Global Medical” coverage for those age 60 and older. Medical questionnaire required. Visitors to Canada: Emergency medical coverage for people visiting Canada. Good for up to 365 days. Must be under age 86. Baggage & Personal Effects: Coverage for baggage loss damage and delay, plus passport replacement. No age limit. Rental Vehicle Damage: $60,000 coverage for damage to a rental vehicle. No age limit. For more details on these plans, please contact your travel agent. * Medical Concierge Services provided by the StandbyMD program. The StandbyMD program is provided by Healthcare Concierge Services Inc. Manulife and its agents are not responsible for the availability, quality, or results of services provided under the StandbyMD program. Please read your policy carefully, paying particular attention to "pre-existing condition", and other exclusions, limitations, terms and conditions that apply to your coverage. a wholly owned subsidiary of Manulife. Manulife and the Block Design are trademarks of The Manufacturers Life Insurance Company and are used by it, and by its affiliates under licence. Accessible formats and communication supports are available upon request. Visit Manulife.com/accessibility for more information. © 2016 The Manufacturers Life Insurance Company. All rights reserved. Manulife, P.O. Box 670, Stn Waterloo, Waterloo, ON N2J 4B8. ™ Trademark of The Manufacturers Life Insurance Company. You can affordably cover your whole family. 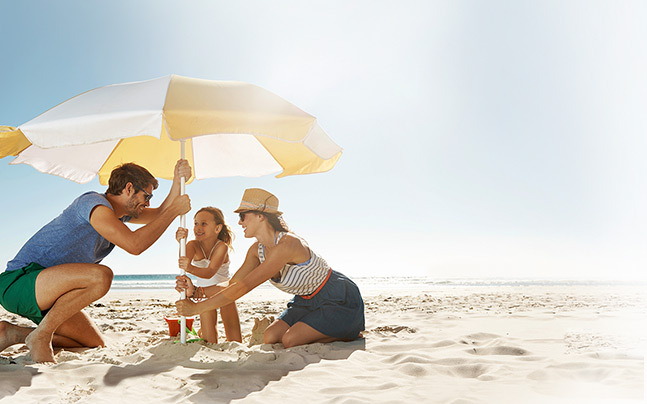 With Manulife Global Travel Insurance, as little as 2 times the rate for the oldest traveller can cover you, your spouse, your children and/or grandchildren. Children must be at least 31 days of age to be covered. The 2 times rate applies to the Global Medical, Travel Canada, Annual Medical and Visitors to Canada Plans. The price is 3 times the rate of the oldest traveller for the All-Inclusive, Canada All-Inclusive and Non-Medical Inclusive Plans. Family coverage is not available with the other plans. Your company or credit card may not fully cover your travel expenses. Not all credit cards provide comprehensive travel insurance coverage. Some credit cards have age limits for medical coverage, or may offer trip interruption, but not trip cancellation, prior to departure. It is important to understand your coverage prior to travel as it may be subject to certain exclusions or limitations. Most claims submitted are for unexpected trip cancellation. Travel insurance is designed to cover losses arising from unforeseeable circumstances. Having the right travel insurance will protect your financial investment and guard against unexpected medical emergencies. Your government health insurance plan only covers a small portion of medical expenses out of province. Provincial health ministries advise Canadians to purchase travel insurance every time you leave the country, because the amount they will pay for health services provided outside of Canada – or even your province of residence – is very limited. It’s important to know that in the event of an emergency, an insurance provider like Manulife will be there to assist you. "; $(".slogan").html(engTagHtml); manulifeLogoImg = "manulifelogo.png"; manulifeLogoImg2X = "manulifelogo@2X.png"; } //end: add language switcher //start: replace the image path dynamically var agencyLogoPath = $("#logoPath").val(); var agencyLogoContent = "" + "" + " " + "" + ""; $(".logo").first().html(""); $(".logo").first().html(agencyLogoContent); var manulifeLogo = "" + " " + "" + "" + "
"; $(".logo02").first().find("span").html(""); $(".logo02").first().find("span").html(manulifeLogo); $(".desktop-img").attr("src", "Landing/images/imgGlobal.jpg"); $(".mobile-img").attr("src", "Landing/images/imgGlobalmbl.jpg"); var lightBoxLogoContent = ""+ " " + ""+ ""+ "